I have not been very faithful to this blog, dear readers. April was not kind and I was overwhelmed with work, visits and travel. It’s May now and excuses are officially out. This is no way to run a blog. So here I am again. Just don’t call it a come back. This particular post pairs a wine and candy from the same locale: China. I suppose it’s timely too because this experience did not quite work out like I wanted. It is not to the same scale as the crisis with Mr. Chen but nonetheless, I raise this glass to you Hilary. I went into this pairing totally blind. (Ok I know that sounds awful considering I just referenced Chen. But I wrote that completely unwittingly. It’s just too late now.) I chose a wine and candy off the smallests of criteria. Let me tell you. It wasn’t a good idea. 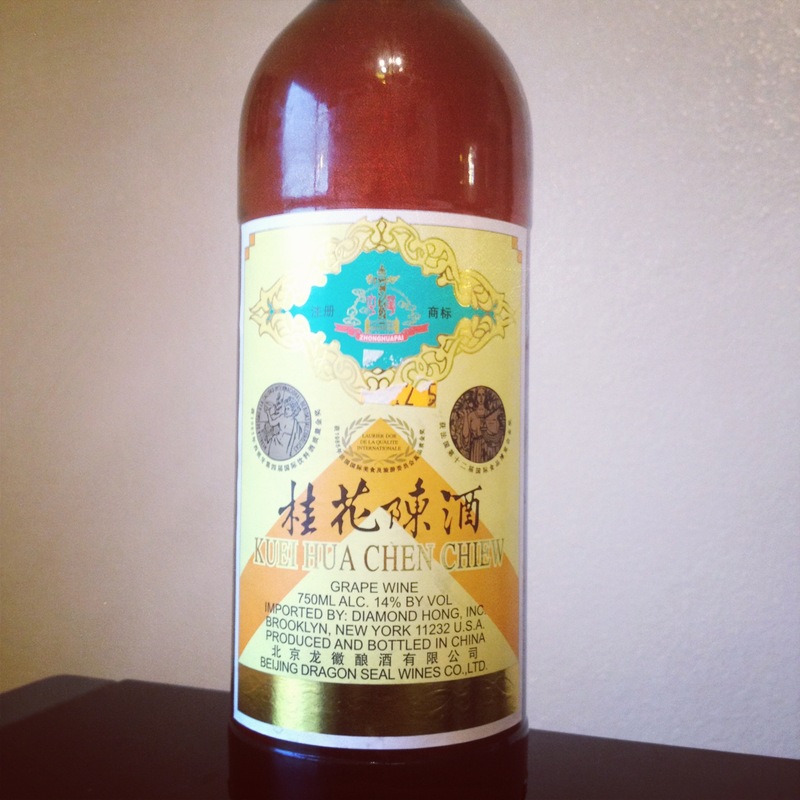 The Wine: Kuei Hua Chen Chiew, Grape Wine. Beijin Dragon Seal Wines Co.
An awesome, great, totally perfect experience that I planned based on endorphines and the thrill of being in a Chinese store (I’m a country bumpkin!). Oh and run-on sentences. This candy reminds a lot of Creamsavers (anyone remember those?) It is extremely creamy and the flavor is thick in your mouth. I actually love it and I’m quite rapidly working through the bag. It takes awhile to go through just one, which is ideal. But for my sommelier expedition, it did not work. You can not drink and eat candy at the same time, so you have to sip after finishing one candy. This wine simply tasted like grape juice and extremely sweet. Make no mistake, it definitely is wine. Sam actually enjoyed it, which worked out well so it can not be too terrible. Would this wine go with anything? I want to say something bitter, but my experience is that a bitter candy does not fix a very sweet wine. I actually could see this wine with Chinese food or something extremely salty. I don’t know if I will venture into Chinese wine again, but if I do, there will be a carton of Chinese right next to me. Posted in Uncategorized and tagged Candy, Uncorked Unwrapped, Wine, wine review. Bookmark the permalink.